Poor reception and snowy pictures can now be a thing of the past thanks to the power of modern aerials. We review the best indoor TV aerials for Freeview. Many homes now have multiple TVs in different rooms, from the living room to the bedroom and sometimes even in the bathroom. One problem with this, of course, is that a lot of houses no longer have external TV aerials on the roof. So you have to pay your cable or satellite company for a multi-room package and run cables all over the place. If you merely want to watch Freeview channels though, then an indoor TV aerial offers a practical and cheap solution. Now, for some, the mention of an indoor aerial may bring back bad childhood memories of their Dad spending hours fiddling around in the caravan trying to get rid of the “snow” on their old black and white portable. But times have changed, and today the best indoor TV aerials offer great reception and picture quality even in areas where the signal is weak. So if you’re looking for a quick and easy solution to your aerial problems, check out the below reviews of the best indoor TV aerials for Freeview. 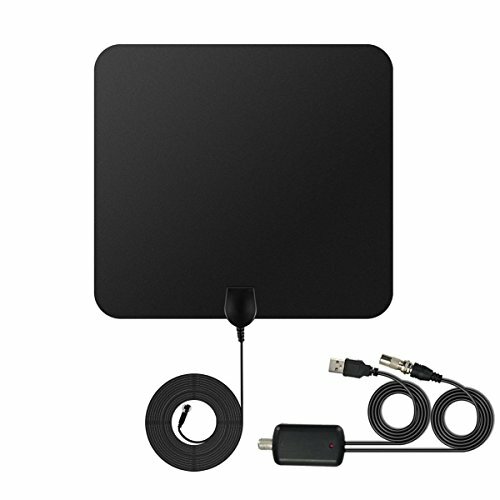 First on our list is the atQuya indoor Freeview aerial. This aerial is incredibly thin and lightweight. Indeed, it is only 0.2 inches thick and is very flexible. This thinness and flexibility make it easy to place anywhere you want for the best signal reception and the 13-foot long cable help in this regard too. So you can put the aerial on a table, fix it to the wall behind your TV or even fix it to your window. In fact, placing it on the window is the manufacturer’s recommended positioning, and we can confirm this gave us the most powerful signal and best results. Installing and configuring the atQuya aerial is also very straightforward; it’s merely a case of plugging it into your TV and then scanning for new channels. The picture quality was excellent with crisp and clear images and no freezing, juddering or skipping, even for HD channels. On the subject of HD, this aerial supports up to 1080p. The August DTA240 High Gain indoor Freeview TV aerial is tiny! Indeed it’s so compact we were initially worried it couldn’t possibly provide a good picture. We were wrong though, as the picture quality is excellent and it has no problems getting reception in even the weakest of signal areas. A significant feature of this aerial is the magnetic base which lets you attach this to any metal surface without having to worry about drilling or fixings. Its small size means it’s very portable and convenient, making it ideal for taking with you on caravan or camping trips. It’s equally suited for the home though, as it’s compactness makes it easy to hide out of view, behind the TV, for example. The RGTech Monarch 50 HDTV indoor TV aerial is another excellent product. The signal strength it provides is superb even in areas where the signal from the local TV tower is poor. The 15-foot coaxial cable is the longest of any of the aerials reviewed here, being slightly longer than the atQuya. This longer cable gives the most flexibility regarding placement for picking up the best signal. As a bonus, the aerial comes with foam tapes for mounting on windows. As well as supporting 1080p HD channels, this aerial also supports 4K HD broadcasts. It is also capable of receiving UHF, VHF, FM, DVB-T and DAB radio. 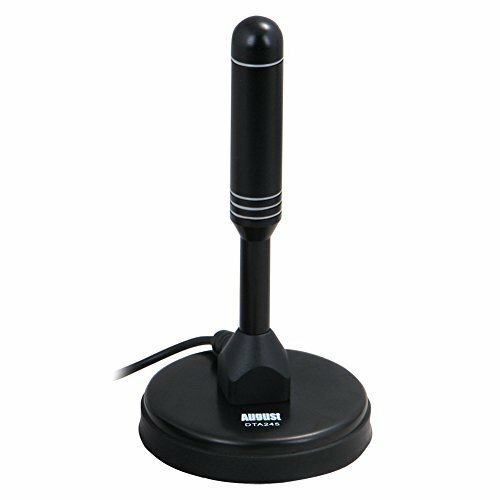 This antenna also boasts a 4G filter which helps to eliminate interference from mobile phone signals. Finally, the RGTech Monarch is effortless to install; like the other aerials reviewed here you merely plug it in and then scan for channels. 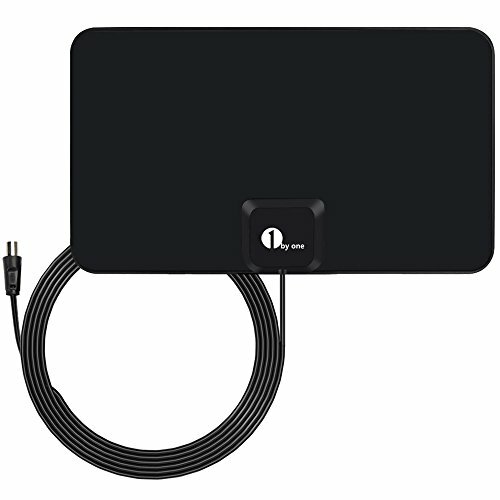 Fourth on our list of the best indoor TV aerials is the 1byone Paper Thin aerial. As the name suggests, this aerial is exceptionally thin and lightweight, allowing you to position it just about anywhere you desire, including on windows where you tend to get the best reception. A neat feature of the 1byone aerial is that one side is black while the reverse side is white. This dual color means it can be matched to just about any decor in the house and won’t look out of place anywhere. Indeed, if neither black or white matches your colour scheme, you can even paint the 1byone aerial! The final contender for the title of best indoor TV aerial for Freeview is the VicTsing Ultra-Thin. The VicTsing is the best-selling indoor aerial on Amazon UK. Its popularity is no doubt partly due to its low price, being one of the cheapest indoor antennae available. Cost isn’t everything though, of course, and the many positive reviews bear testimony to the fact that this aerial punches above its weight as far as reception and picture quality are concerned. 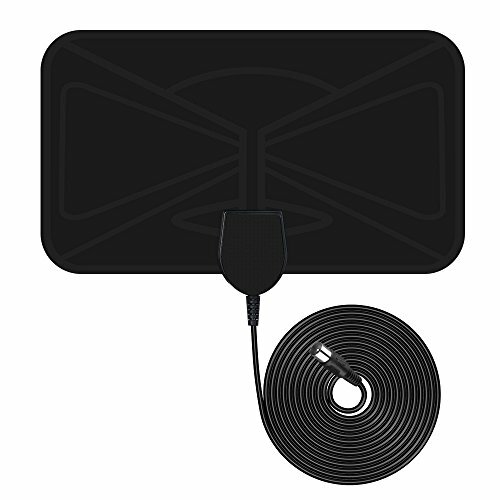 It does have a shorter cable (10 feet) than most other aerials here, but that’s only a concern if you’re in the position where you need to place it quite a distance from your TV to get the best signal. That won’t be an issue for most people. The reception range is also significantly less than the other models reviewed here. Its specifications list the range as 25 miles plus compared to the 50 miles offered by the other aerials here. This is something you need to bear in mind if you live further than this from a TV transmission tower. If you’re confused by some of the technical terminology, here’s a quick buyer’s guide to things to take into account to help you choose the best indoor TV aerial for you personally. The first, and single most important thing you must consider is the reception range offered by the aerial. The aerial you choose must be powerful enough to pick up the signal from your local TV transmitter. If it’s not, then any neat features and cool looks don’t matter at all. The range will obviously be more of a concern for those who live in more rural locations than those who live in cities that are typically close to transmission towers. 1080p resolution is now a bare minimum HD standard for a TV aerial so look for a product that supports at least this. The actual resolution support you need will obviously depend on the capabilities of the TV to which you’re going to be connecting it. You will also want to look for an aerial that is compatible with as wide a range of TVs as possible to cater for future upgrades of your TV. Some aerials such as the RGTech Monarch reviewed above also support DAB radio too. The longer the cable that comes with your aerial, the more choice you have as to where you can place it in relation to your TV. This will make it more likely you can get the best possible reception. The smaller the aerial, the less intrusive and noticeable it will be. You also want a decent-looking aerial that blends in well overall with your room’s decor. The more lightweight the aerial is the easier it will be to fix to a wall or window. You should also consider where you’ll be fixing your aerial in place. If it’s on the wall, does it come with wall fixings? What about window supports? Many of the best indoor aerials today come with clear stickers that let you easily fix them to windows. Modern 4G mobile phone signals can interfere with your TV reception. Some of the top aerials now come with mobile interference protection. If you’re not tech savvy, and even if you are but aren’t a masochist, you’ll want an aerial that’s as simple to install and configure as possible. Many top aerials these days are basically plug and play, so it’s just a matter of connecting them to your TV and then scanning for new channels. Even the best indoor TV aerials are pretty cheap these days, but even the best equipment can and does go wrong sometimes. And when it does, you want to be covered so you don’t have to shell out for a new one out of your own pocket. So always consider how long the warranty is that comes with your chosen aerial. We’ve presented reviews of some of the best indoor TV aerials for Freeview. Each of these products offers excellent signal strength and picture quality even in low signal areas and through thick walls. 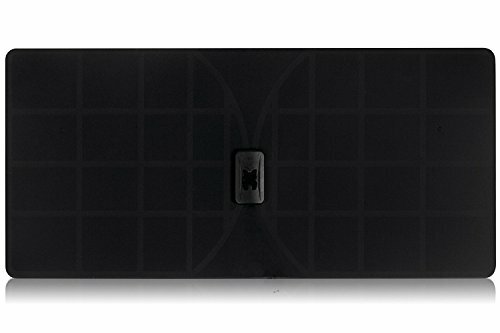 Our choice as the overall best indoor TV aerial is the RGTech Monarch 50 due to its support for 4K broadcasts, its long cable, and its light weight and flexibility. For those on the tightest budgets, the VicTsing Ultra-Thin is an excellent alternative.